When two Tibetan protesters set themselves on fire in front of Lhasa's famous Jokhang temple last month, it marked a fresh twist in the decade old Free Tibet movement. This was the first time that such protests against Chinese rule occurred in the capital city, far from sites of earlier self-immolations in eastern Tibet. One of the protesters, 19 year-old Tobgye Tseten, later succumbed to burn injuries. 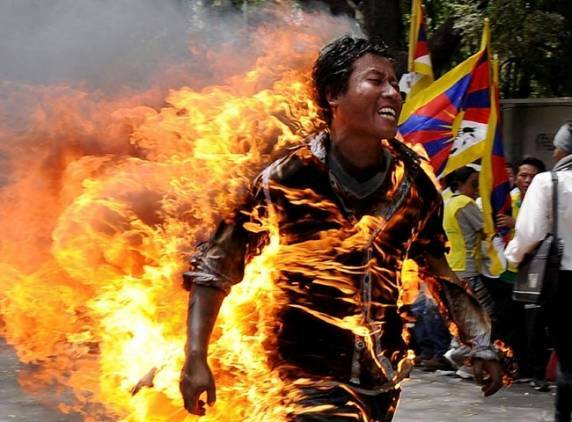 The gory sight of people setting themselves afire and screaming in agony and flames – is one that most Tibetans have been acclimatised to over the last one year. More than 40 people have taken to such extreme acts in China administered Tibetan regions since March 2011, when a monk named Phuntsog set himself on fire in Sichuan Province. Nearly 32 people of them have died due to burn injuries. The flames of this raging fire even reached New Delhi hours before Chinese President Hu Jintao’s visit to India in March this year, when 26-year-old Jamphel Yeshi committed self-immolation at Jantar Mantar. Even as Hu Jintao arrived to attend the BRICS Summit, Yeshi breathed his last at a hospital not far from the summit venue. The recent spurt in self-immolations have only served to underscore the widening discontent over Chinese rule across Tibet. Since the Jokhang temple incident, security forces in Lhasa have been carrying out frequent and enhanced identity checks in the region. New York based Human Rights Watch (HRW) says that hundreds of Tibetans in Lhasa have been arbitrarily expelled from the city by local authorities in a bid to enhance the security. Some, in eastern Tibet, have been ordered to leave not only the capital, but the entire Tibet Autonomous Region. The clampdown has been unprecedented as it extends to Tibetans who have valid business permits to live and work in Lhasa for years, the report further added. "This arbitrary expulsion of people because of their ethnicity or place of birth is clearly discriminatory and violates their basic rights to freedom of movement and residence," explains Sophie Richardson, China director at Human Rights Watch. "Additional arbitrary restrictions by authorities are likely to deepen tensions," she warns, adding that authorities in Beijing must understand that the solution to problems in Tibet does not involve more troops and discriminatory restrictions. Meanwhile, in a move believed to distract the world’s attention from protests inside Tibet, China has announced that it will allocate £40 million in building 22 model villages across Tibet to raise the economy of the region. Ironically, the announcement from the authorities came merely a few weeks after China decided to ban any foreigner from visiting Tibet. "Tibet is cut from the rest of the world over the last one month. All international tourists and media has been banned from visiting Tibet. Besides, most towns and cities are heavily guarded by police, anti-riot SWAT forces and a reserve of military is always stationed on the outskirts of the township. Moreover, plainclothes informers have deeply permeated into people's personal spaces," says Dharamsala-based Tibetan activist Tenzin Tsundue. Sundry reports on social media and eyewitness reports shared with Human Rights Watch indicates that Chinese authorities have imposed a range of limitations on movement in and around Lhasa, including the expulsions, as well as a ban on public gatherings of more than three people in the city. This has led to the cancellation of daily group activities, such as physical exercises normally held in front of the Potala Palace in Lhasa, according to a source in Tibet with direct knowledge of the events. The Dalai Lama last year accused Beijing of "cultural genocide" in Tibet. He attributed the wave of self-immolations to a harsh crackdown by authorities on Tibetan culture and religion. In an exclusive interview with The Sunday Indian, Prime Minister of the Tibetan government-in-exile at McLeodganj in Dharamshala Dr. Lobsang Sangay said that "the situation inside Tibet is getting worse every passing day." Sangay, who completed his early education from Delhi University addressed a gathering of angry Tibetans at Majnu ka Tila after the self-immolation and death of Jamphel Yeshi in the national capital earlier this year. Amid such resounding chants of freedom, the recent spurt in the string of self-immolations inside Tibet show no signs of abating. At least not for now.